Rajiv Ouseph, badminton’s British number one in men’s singles, says he was fortunate his parents were not like “most” Asian families. The 31-year-old and his two older sisters were encouraged to play the sport from an early age and his parents, who emigrated to England in their early 20s, supported his career choice. “My dad played a bit in India and then got back into it when he moved over here,” says Rajiv, an England medal hope for the Commonwealth Games in Australia. Alongside his two siblings, Rajiv progressed through the junior ranks, winning county and regional level tournaments. His natural talent for the sport, combined with a willingness to practice, learn and improve, saw him eventually break into the national set-up. Despite encouraging him to play badminton on a social level, Rajiv’s friends and extended family had some reservations about him turning professional, as did his parents. “Aunties and uncles raised their eyebrows at me wanting to play full-time,” says Rajiv, who was born in Hounslow in London but now lives near the Badminton England headquarters in Milton Keynes. “It’s not a well-established career path for young Asian people, families don’t see it as being a doctor, banker or accountant. “There was a bit of a ‘discussion’ – shall we say – with my family on whether it could be a feasible career for me. 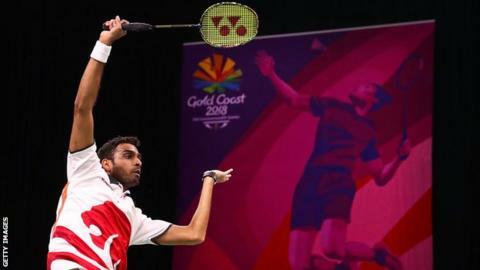 Rajiv, who won a men’s singles silver medal at the 2010 Commonwealth Games, says there has to be a balance between academia and playing sport, but believes the focus on education limits the number of Asian people doing exercise. “Being sporty is not seen as the thing to do,” he says. UK Sport’s Active Lines survey (May 2016-17) showed just 6.6% of the British Asian population participated in sport or physical activity twice in the previous 28 days. Although participation rate is an issue within black and minority ethnic (BME) communities, badminton seems to be bucking that trend. The number of British Asians playing the sport regularly is almost three times more than any other activity. Henry Gaspard is chairman and founder of the Black Arrows Badminton Club, launched in 1984 as a way of providing unemployed people in Tottenham, the majority of who were black and Asian, an opportunity to play badminton. “The name we used was to reflect who we are – ‘black’ represented us as a group of players and ‘arrows’ was the impact we wanted to make on the game,” says 58-year-old Henry, who moved to England from St Lucia in the West Indies aged nine. The Black Arrows have evolved over the years, with the club now working with schools, community groups and local authorities across London. As I join the club for weekly training in East London, I expected, as their name suggests, to only see players from BME backgrounds, but was surprised to find such a diverse group of participants. “What Black Arrows is about, as a club, is to make everyone welcome, regardless of your colour, religion, nationality – we just want to make you a part of what is going on,” says Henry. Angela McCarthy, from Malaysia, and Nakul Singhal and Vijayakumar Devarajan, both from India, have been playing at the club for several years and enjoy the sport for different reasons. Angela, who played badminton at school, says she is “never intimidated” even if she is the only woman on the court. “It’s different from playing in Malaysia because here I get to play against the Chinese, Filipino and Tamil communities, amongst others,” she adds. Nakul found it as a way of meeting new people and socialising after moving to England aged 14. “I felt the badminton community so welcoming,” he says. Vijayayakumar had never played badminton at home in Chennai. Now a coach at Black Arrows, he says: “It’s a game you can play for 365 days a year, have fun and meet new people. Black Arrows are demonstrating how sport, and badminton in particular, can encourage social integration for immigrants and breaks down barriers and stereotypes, allowing players to mix with other communities and nationalities. So what else can be done to get more people from Asian backgrounds playing sport? Rajiv believes there needs to be a cultural shift in the mindset of most families and says badminton helped him, his sisters and his parents to bond. “Rather than just going to each other’s houses to socialise, families should use sport as a get-together. Badminton is an easy sport to try out. Most leisure centres will have courts to hire and racquets and shuttlecocks for you to rent, and Rajiv encourages people from all backgrounds to give it a go. “It’s not expensive and gives you an all-round workout,” he says. As Rajiv looks forward to competing at the Commonwealth Games for the third time, he modestly plays down the suggestion of being a role model for young Asian boys and girls, but adds: “I think if anyone is playing or interested in badminton because of me then I’m privileged.